Before the mass release of Windows Mobile 5.0 devices, there will appear some products based on the second version of Windows Mobile 2003 for Smartphone with the support of QVGA resolution. 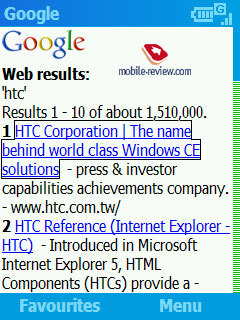 Among them are HTC Hurricane and Samsung i300. We publish a separate review on built-in applications, so we don't have to describe the same functions every time. 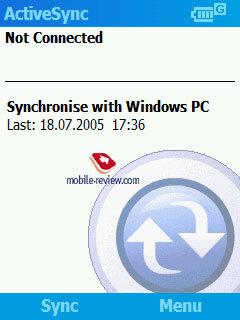 Like in case with WM2003 for Pocket PC, the operating system is built on Windows Compact Edition (WinCE) core. It is ever more facilitated compared with Pocket PC analog. For example, there aren't any built-in office applications, such as Pocket Excel and Pocket Word and some other programs. The key idea of Microsoft engineers for the phone OS shell is a single-handed control. Thus the interface differs much from Pocket PC, which has a sensor screen and needs both hands involved: the one with the stylus and the other with the PDA. Unlike its predecessor, MS Smartphone 2002, the new OS is built on WinCE .NET core instead of WinCE 3.0. Compared with the 3rd version the code was written almost anew. In functional aspect this enabled the support of network adapters (Bluetooth and Wi-Fi), .NET framework. The most important thing for the final users is the performance - the speeds got noticeably higher (though the growth isn't that clear as in case with Pocket PC). 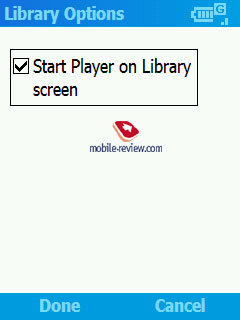 You can notice it while navigating menu, playing video and opening Web-pages. At the same time the interface changes aren't noticeable (if we compare with MS Smartphone 2002 and WM2003 for Smartphone). The main distinction of the second version from the first WM2003 for Smartphone (the review is available here) - is the support of QVGA screen resolution (320x240 pixels) and improved Web-page viewing (without horizontal scrolling). 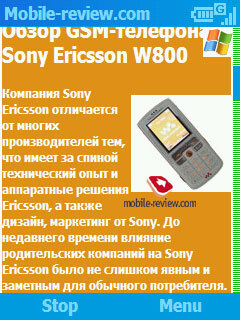 The tests of WM2003 for Smartphone SE were done on HTC Hurricane and Samsung i300. The key improvement of the second edition is increased screen resolution from 176x220 pixels to 320x240 pixels. Screen dimensions being unchanged, and image gets twice as detailed. The fonts become smoother and images look more distinct. It's more comfortable to work with the Internet, view pictures and video, navigate maps on such screen. The reverse side of this improvement reveals compatibility problems. Almost all applications get launched and work, but many of them have problems with correct view. As the 320x240 pixel resolution isn't multiple to 176x220, it's impossible to apply Pixel Doubling (the technology stretches images to adjust the screen, it was used for the switch from QVGA to VGA on Pocket PC). 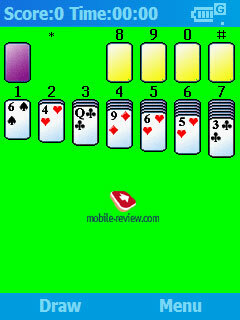 For example, many games are displayed at the left top corner and occupy 50% of the screen. New games are displayed in the center surrounded by black frame. 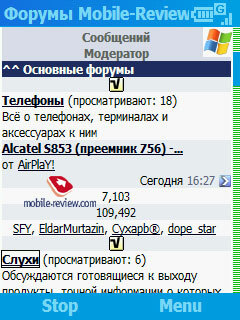 The most spread problem for applications occupying the whole screen is incorrect view of fonts and icons. The developers have already started updating their programs to new resolution, and many programs do work correctly. With time the compatibility problem won't be significant. The same situation happened with Pocket PC platform during the switch from QVGA to VGA. 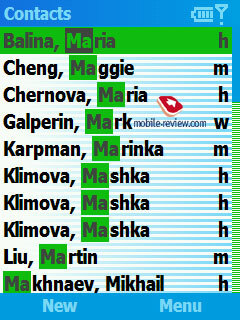 I'd mark a weighty advantage of Windows Mobile against Nokia Series 60 in the compatibility aspect with old software. 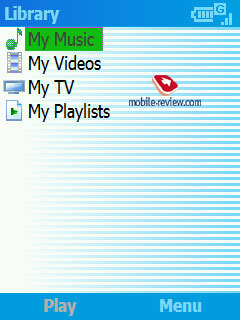 There might be problems with correct view, but applications do get launched and work unlike different Nokia Series 60 devices, there the compatibility problems arise even within the one OS version (for example, Nokia 6630 and Nokia 6680/6681). 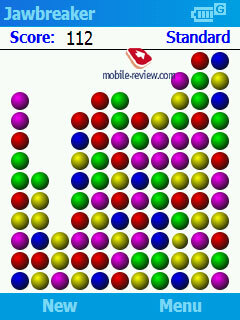 The operating system works in standard resolution of 320x240 pixels. The top line of icons displays battery charge level, signal reception level, GPRS networking. Below we see icons of recent launched applications. 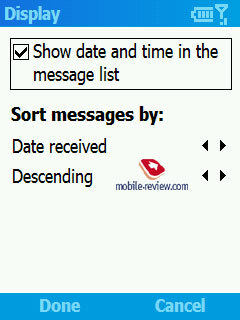 Then are the lines displaying operator name and date/time, next or current calendar event, mailing state (the number of unread SMS, MMS, e-mail messages) and current profile. A level down you see inscriptions for soft buttons. 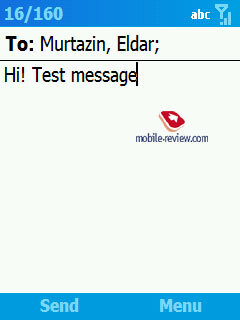 You can navigate the startup screen with the pad and fall in the necessary position (for example, e-mail client). You can change the design of startup screen as you wish using themes: change dimensions and location of objects, color scheme. The easiest way to create a theme is to download a special application from Microsoft site. It's quite easy in use, but its opportunities are poor: it allows changing the background and color scheme, besides it isn't adapted to QVGA resolution. The best results can be achieved with manual editing of XML file (the theme consists of archived graphical files and a XML file). You can add different plug-ins of exterior developers to the startup screen: for example, analog watch, alarm clock, calendar and so on. Press "Start" button to switch to menu with programs and settings. You can navigate menu with the 5D-pad and digital buttons (look at the number to the left from the application name, this principle is applied in the operating system everywhere). Now let's speak about standard programs. 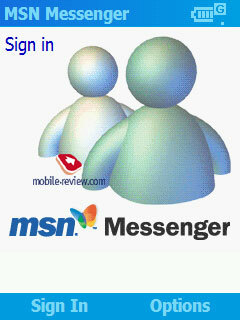 This application is responsible for all types of messages (e-mail, SMS, MMS). The built-in mail-client for Pocket PC leaves much to be desired, this is also true for the phone operating system: there is no support of HTML and pictures in e-mail, the letters on the server are marked as read. 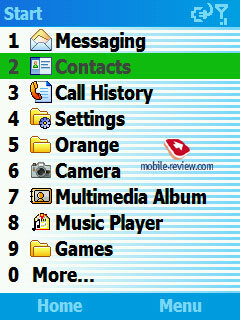 E-mail is separated from SMS, everything is not in one place like in MS Smartphone 2002. You can set mail checking on schedule with several mail boxes. 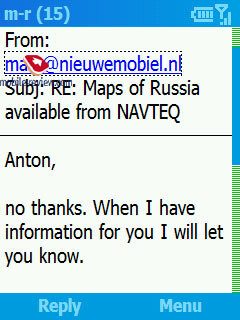 I'd note the major plus here, there were no problems with reading Russian encodings. 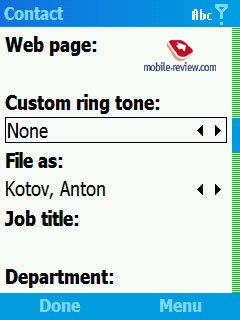 (The only mistake I noticed was incorrect view of Russian names in message titles, this problem will be solved in Windows Mobile 5.0). It's possible to sign messages automatically. 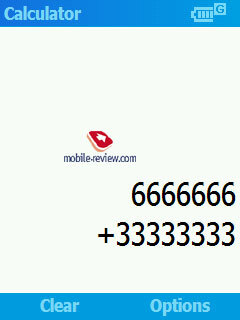 The number of messages is limited by free memory space available. As default the operating system doesn't supports EMS, there is no MMS editor, so you have to settle this drawback by programs of third companies. With exterior programs you can do almost whatever you want with SMS: send SMS on schedule (SMS Scheduler), send MS from desktop PC (Dr. Neil's SMS Utils). However, it's possible to send SMS from desktop PC using Active Sync Remote Display, which displays smartphone screen on the desktop PC. But we didn't find a good substitute to work with e-mail. We'd like to believe that sooner or later such program will come out. 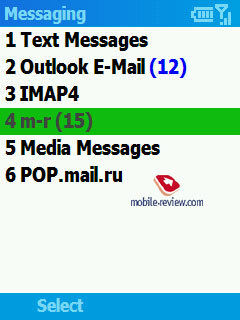 A normal mail-client for Pocket PC has recently appeared - this is a new version of Web IS Mail, so we are looking forward to the version for Windows Mobile 2003 for Smartphone SE. 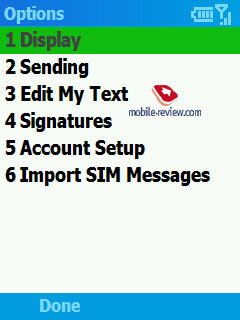 It's possible to make a call or send SMS from contact menu. You can assign a melody for a contact (now it's possible to set MP3 melodies). You can filter the contact list by categories. The opportunity to display photo during incoming call will appear in Windows Mobile 5.0, and now it's possible to do it with some exterior programs (PhotoID, for example). You can blacklist contacts with SmartFilter. 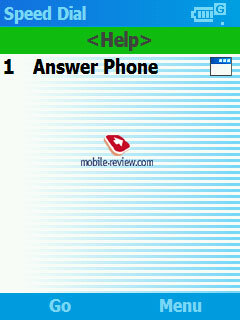 When you dial a number from the startup screen, there runs a search through all contacts, incoming and missed calls. A very nice thing. 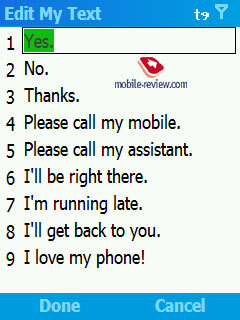 It displays history of incoming/ outgoing/ missed calls. 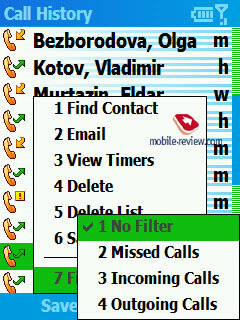 You can also filter calls and see, for example, only missed calls. 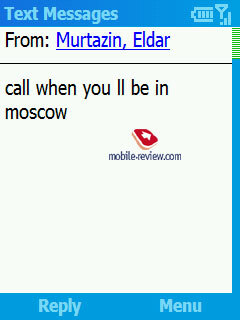 Call History can be exported to MS Outlook log via MoDaCo Smart Journal. 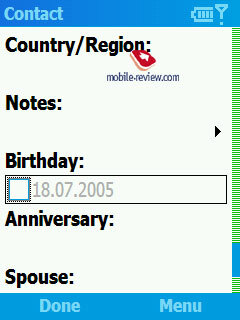 This application displays events. 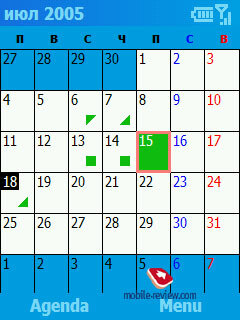 This is an analogue of Calendar in desktop MS Outlook. In case when there is no touch screen, it's more comfortable to create events in desktop PC and then synchronize them with the smartphone. 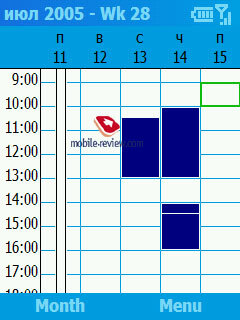 You can view events for today, week and month. As a matter of fact the program copes well with its functions, but if it's not enough, you can use an alternative application Power Calendar by DeveloperOne. 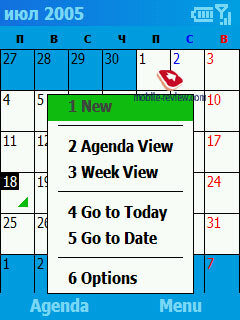 It works with the common database, so all events will be displayed in built-in calendar and synchronized with MS Outlook. However Power Calendar costs almost $20. The capabilities of this built-in manager are poor. 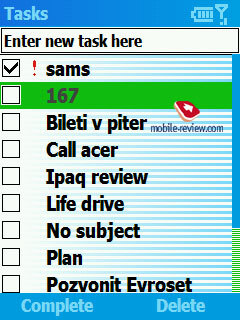 Virtually you can just enter the name of the task, delete the task or mark it complete. There is an alternative to it Power Task by DeveloperOne, the nominee to variety of awards. It is priced at $15. It's a browser of Internet sites. You can view on a smartphone screen almost any sites due to new 320x240 pixel resolution and the opportunity to stretch the page into a column without horizontal scrolling. The only limitation is screen size - if you read texts on a small screen for a long time, your eyes get tired. As for the alternatives, I'd mention Opera browser, the 8th version has been recently released. It's a media player. 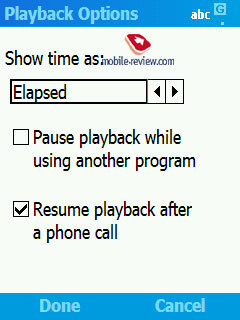 It enables video and music playback. The 10th version has new design and can synchronize content with desktop version of Windows Media 10. The program got the library to arrange all file by album, artist and genre. The player is good for music, but you'd better look for an alternative for video. The alternative can be The Core Pocket Media Player (renamed Beta Player, plays music and video, the best player at the moment), Pocket TV (mpeg2 video) or PocketMusic (mp3, ogg). This application runs synchronization with desktop PC via a cable, an infrared port and Bluetooth. 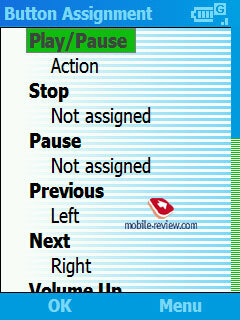 Time of last synchronization can be displayed. 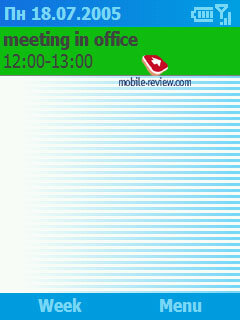 You can set synchronization of contacts, mail, calendar. The minus - text notes can't be synchronized. 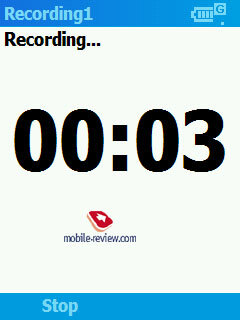 The problem is solved with MoDaCo Smart Journal or SmartphoneNotes. 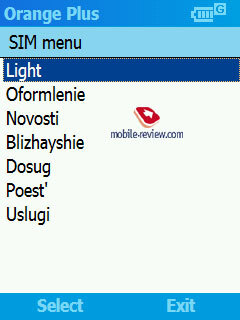 As you see by the name this program is meant to work with SIM menu of the operator - if supported, of cause. We didn't find any peculiar tings about it. It's an Internet pager by Microsoft. As a matter of fact it looks strange when you enter texts using digital keypad of the Internet pager, when your mate uses a full size keyboard. But it's good to enter a couple of works in case of necessity. There is an alternative - AgileMessenger 2.0 client, which supports almost all varieties of Internet pagers. You can quickly launch applications or dial contact numbers from the startup screen. 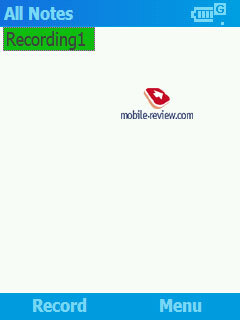 It's possible to add voice notes. There is nothing special to tell you about it. 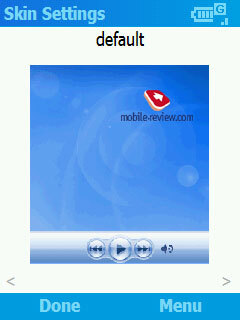 Using this program you can make voice notes. Unfortunately, text notes are not set as default, you need to install additional program. It's an ordinary calculator, the same as in phones, nothing special. There are two preinstalled games like in Windows Mobile 2003 for Pocket PC. 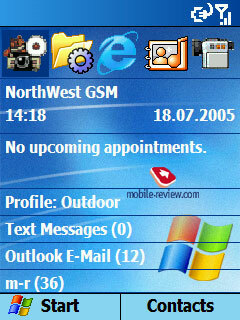 In WM 2003appeared Jawbreaker, in MS Smartphone was just Solitaire. Naturally, there are plenty of colored and interesting games released for this platform. But I'd not one more time they aren't adapted to QVGA resolution. I don't think any of you mean to work comfortably with MS Office documents on a small sensor screen, but you might need to have a look at a MS Word document sent by e-mail or a Power Point presentation. Unlike Pocket PC there are no built-in programs to work with documents, but there are some exterior programs. To my mind, the best office package is ClearVue by WESTTEK (by the way there is a version for Pocket PC). 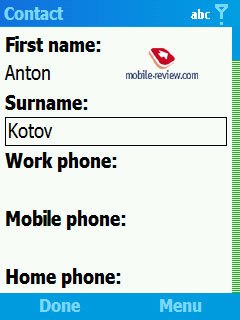 It can view documents with original formatting: MS Word, MS Excel, MS Power Point, Adobe PDF, graphical files. I'd also mention Picsel Viewer package, which can display in original almost any office document, but unfortunately, it isn't distributed for free, only with the models. 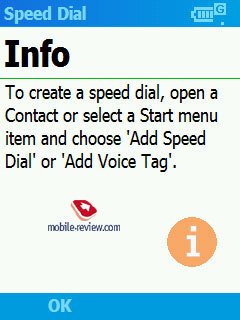 The capabilities of the phone book are rich, there is an optimized contact search. As for functionality of other built-in applications, it's quite sufficient. If you need more functionality, some exterior applications can help (freeware very often), that's the advantage of smartphones against ordinary phones. The life cycle of Windows Mobile 2003 for Smartphone SE for QVGA resolution is limited and soon it will be replaced by Windows Mobile 5.0. But that's the topic for next reviews.